Not my scan, stolen from Sasmira's Livejournal. This is from X Infinity, this picture was used as the design for the X DVD Box for DVD's 9-12. Oh My God. Beautiful just wow *hugs* I Love it! 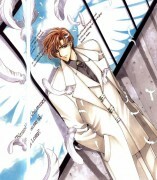 Yin and yang with style, Clamp certainly knows their stuff!! This scan is great, I think I also happen to have this one, but still... I just couldn't resist the pull of Subaru-kun's magnetism! Hei.. What a good picture! 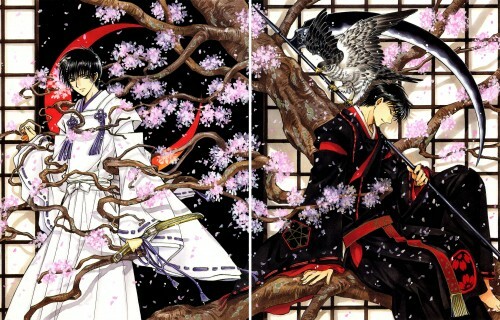 This is an awesome piture of Subaru and Seishiro. There both cool characters except once again tokyo babylon is so sad!!! Go pic!! Sad destiny, intertwining the fates of SUCH HOT GUYS and then killing the coolest one off!!!!! Anyway, a great scan, as always. Very beautiful! The art is wonderful and the colors are very bright and very rich! Thanks so much for sharing it! awsome pic.... i luv them sooo much!!! they r sooo kwel... hav u seen seishiro in tsubasa yet?? ?